On Monday evening we were biking around on errands, one of which was to check if the laundry guys’ were done with our stuff. It was a pickup and delivery service, that’s why we didn’t know where they were exactly. But we were in their neighbourhood and figured we’d pay them a visit, just to see if we could save them the trouble of delivering to us at the towers. Looking for the place and turning off the main road, I followed a bumpy path to the setting pictured above. A scene of stark contrast; a plate shack sitting in the shadow of a construction crane, resting ominously overhead, reaching far and emitting cold blue light. On the ground in front of the shack, a small fire was burning. The tangy scent told me it was mostly plastic. An old lady stood by it, observed me through the smoke, as I observed her. Color temperature contrast: cold blue light versus the warm yellow one. Overall juxtapose; the synthetic construction crane and building foundations are drawing closer the more organic life below. 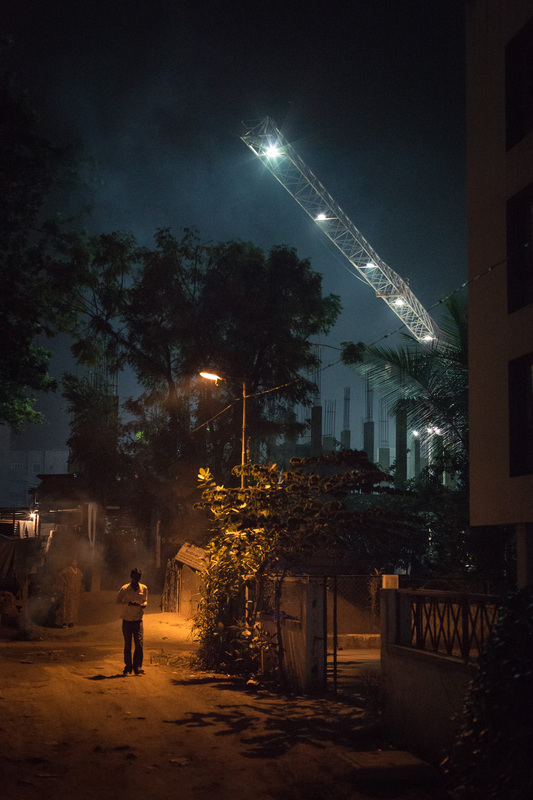 The similarities between the street light and the crane light, how they line up and both pose above the man, but at different levels. Midground transition, from trees to straight foundation pillars – almost like trees who have lost their foliage.